P and D Automotive is an automotive dismantling facility specializing in late model automobile and truck salvage. 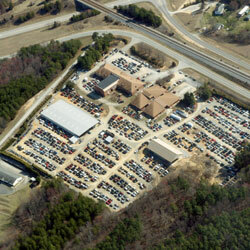 Located on the grounds of a former elementary school, we maintain over 1500 vehicles on 16 acres. With over 70,000 square feet of indoor storage space, most of our used parts are removed from the parts vehicle, shelved and protected from the elements. We believe this is necessary to ensure high quality products, particularly those sensitive to the outdoor elements. With most parts already dismantled, quality checked and ready for delivery or shipping, we can provide our customers with the parts they need quickly. P & D Automotive Systems, Inc.
Used Auto Parts NC is part of the Automotiveinet business network. It offers tips and guidance to consumers looking to buy quality used auto parts for cars, trucks, vans, and SUVS. Find used auto parts in NC, Wake County, NC including: Danville, Pelham, Eden, Reidsville, Roxboro, Martinsville, South Boston, Greensboro, Henderson, Pittsylvania County and Caswell County areas. P & D Automotive Systems in Pelham NC - Danville area. Automotian, Automotiveinet and "Automotive Starts Here" are all trademarks and/or service marks of Automotive Industry Network, Inc.